Atomically thin semiconductors, such as transition metal dichalcogenides (TMDs), are a recent addition to the family of 2D van der Waals materials that includes graphene and hexagonal boron nitride. Due to exceptionally strong many-body effects in TMDs (e.g. WSe2, WS2, MoSe2, and MoS2), the light-matter interaction is governed by tightly bound quasiparticles including excitons (electron-hole pairs), trions (charged excitons), and biexcitons (exciton pairs). As such, future TMD-based opto-electronic, photonic, and quantum technologies will benefit from a quantitative understanding of the optical and electronic properties of these quasiparticles. In this talk, I will discuss how the complex optical response of monolayer TMDs can be disentangled using 2D coherent spectroscopy, which is an ultrafast nonlinear optical technique that probes for correlations between the excitation and emission energies of the material. The 2D spectral maps reveal previously unknown properties and unexpected phenomena in TMDs that are inaccessible with conventional spectroscopy methods, including: (i) dissipative interactions and disorder that broaden the optical transition linewidths; (ii) quantum beats associated with coherent and incoherent energy transfer; and (iii) ultrafast optical generation and detection of exciton and trion valley coherence (superposition of quasiparticles in opposite momentum valley states). Possible strategies for controlling the light-matter interaction strength and manipulating the valley quantum degree of freedom as a novel information carrier will also be presented. 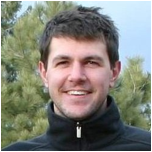 Galan Moody is a member of the Quantum Nanophotonics Group at NIST, Boulder. Galan received his Ph.D. from the University of Colorado in 2013, where he studied the effects of morphology on the optical and electronic properties of semiconductor nanostructures using multi-dimensional coherent spectroscopy. He is a recipient of a National Research Council Postdoctoral Fellowship to investigate new approaches for manipulating optical coherence and coupling in quantum dots. His current research focuses on probing and controlling light-matter interaction in semiconductors including 2D materials and quantum dots, as well as their integration with nanophotonic, opto-electronic, and piezo-electric devices for dynamic tuning of their properties.